There have been several Reunions since 2008 ranging from just two ‘old’ girls meeting up to major events in 2012 and 2014. If you have any photos or information of any reunions please send them to Liz Donlan (contact details at bottom of page) and I will gladly publish them. There are also reunions of groups of girls living in close proximity overseas; girls meeting up overseas whilst on holiday; reunions of small groups. For details of these please have a look at the Mini-Reunions page. The cost is £20 per person which includes coffee/tea and cakes on arrival, 2-course hot or cold lunch, tea/coffee and biscuits in the afternoon and a few special mementos. There will also be a raffle - the first prize is one night's dinner, bed and breakfast at St Elphin's in either the Chatsworth or Haddon Suite. Initially priority will be given to old girls and staff but if there are any places left they will be open to family and friends. A reunion of Old Girls was held at St Elphin's Park (formerly St Elphin's School) and Hartington Hall on Saturday, 12th October, 2013. For a full report, photos and a video of the day see 2013 Reunion. A Reunion of Old Girls was held at St Elphin's Park (formerly St Elphin's School) on Saturday, 6th October, 2012. For a full report and photos of the day see 2012 Reunion. 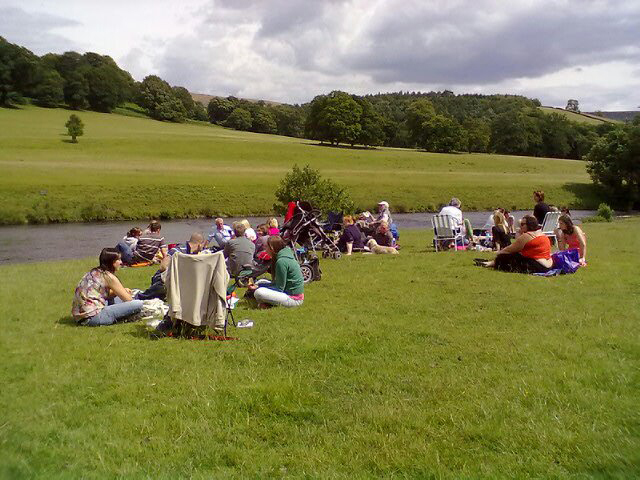 Approximately 20 people turned up for a reunion held in the form of a picnic at Chatsworth (Photo: Lizzy Atwell-Dickie). 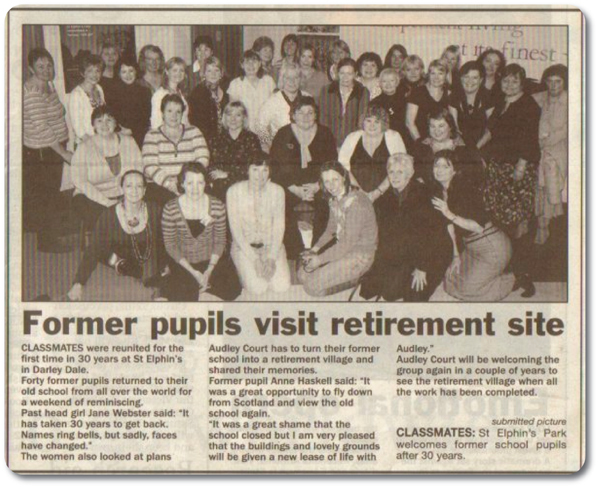 The photo below was taken at the final Reunion held at the School in 2003. 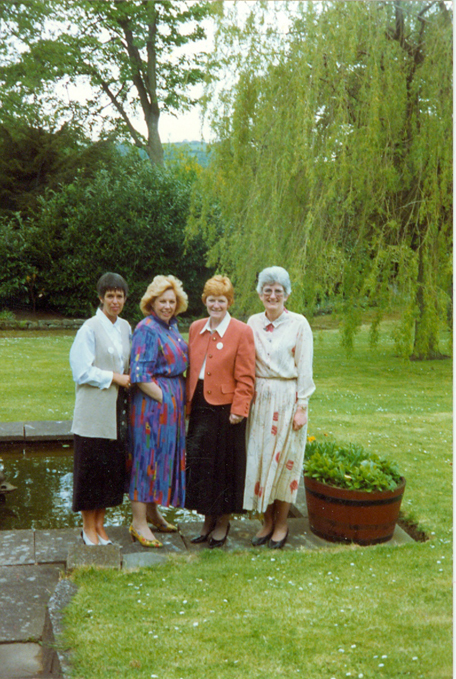 LtoR: Jean-Christine Turner-Dornan (1959-1964), Christine Tew (1960-1964), Roz Seville-Maudsley, Elizabeth Waters. Christine Tew was both Secretary and Treasurer of the Old Elphinians (formerly St Elphin's Old Girls' Guild) for a number of years. Photo supplied by Christine Tew. The following photos have been provided by Christine Tew. They were taken at a reunion held in York which she thinks was held after Mr Pollard's retirement in 1994. Mr Pollard was the Head Master from 1979 - 1994. If anyone can identify the year for certain then please let Liz Donlan know. Please click on each of the 4 photos below for larger versions. 1994 saw the largest-ever reunion held at the School with a Dinner Dance being the highlight of the ocassions – at which there were approximately 162 diners. 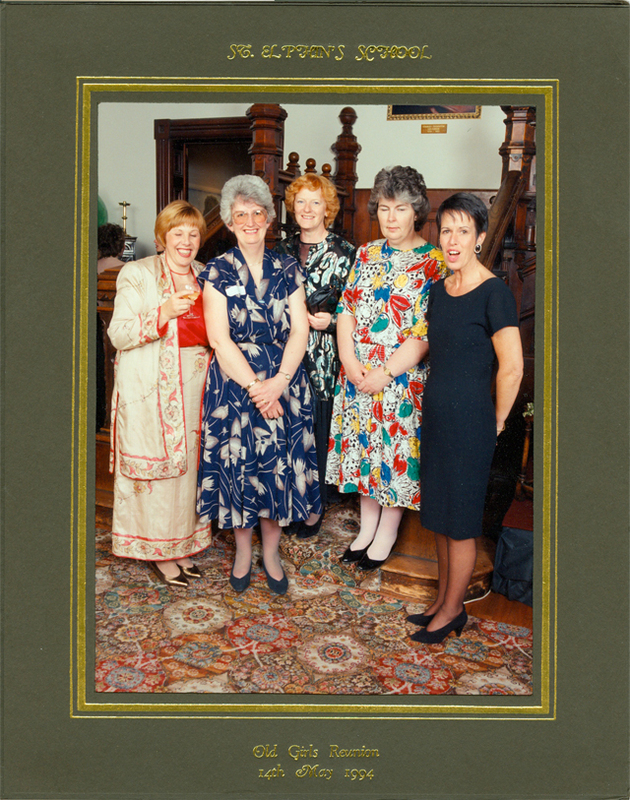 The photo below shows 2nd from left Christine Tew (1960-1964), 3rd from left Sheila Allen. For further photos of the Reunion please see the Photo Album. Photos supplied by Christine Tew. 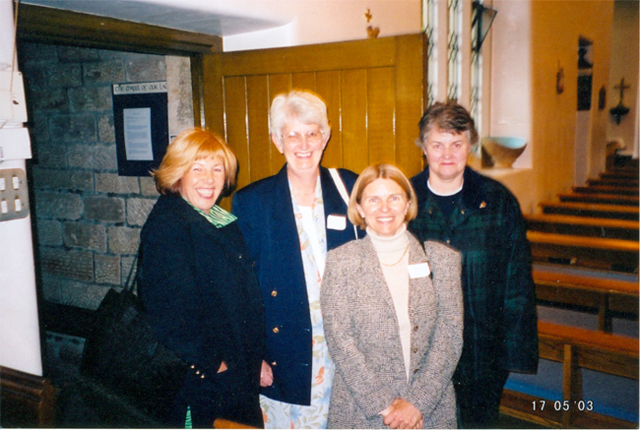 We think the photo to the right is from the 1993 AGM & Reunion which was held in the Common Room at St Elphin's. If anyone knows whether the photos are definitely from 1993 (or not!) then please let Liz Donlan know. taken near the fish pond which was situated outside the dining room. The following photograph has been aupplied by Christine Tew who thinks it was from the 1992 reunion which was held at the RAF Club London. The front row are sixth formers who came with Mr Pollard (Head Master 1979 - 1994). 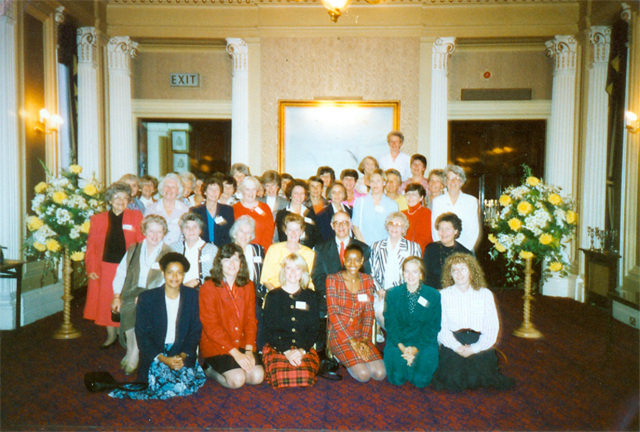 The reunions at the RAF club were organised by the late June Gibson.